Or, perhaps, I’ve simply awakened from my juvenile sports-based fantasies. You know, the ones about hitting the winning home run, or somehow overtaking and tackling the speedy running back thereby protecting a victory, or throwing a discus an impossible distance. No, I think sport changed. Or, my romantic perceptions of sport were corrected by reality. — After Sports Illustrated, and the daily newspaper sports sections, and the nightly ESPN news roundups, became more about multi-million dollar contracts, off-field criminal behavior and performance enhancing drugs than contests on the field. — After a family of four requires a couple of benjamins to attend a professional sporting event. Exactly where do the billionaire owners in their penthouse skyboxes think the next generation of fans is going to come from, if their parents can no longer afford to take them out to experience for themselves the awesome sensory experience of a live baseball or football game? — After it became increasingly obvious that the Olympic games, ever portrayed as the ultimate purity in amateur athletic achievement, became a showcase for professional performers, first covert, now flaunted, and mainly a quadrennial showcase for global advertisers. And the cities and nations who competed desperately for the “honor” of hosting these global festivals were often discovered to have resorted to flagrant bribery to win the privilege of burdening with outlandish debt its citizens for 30 years or more. Honor, indeed. And now, finally, the pinnacle of political and commercial cynicism, the 2008 China Olympics. 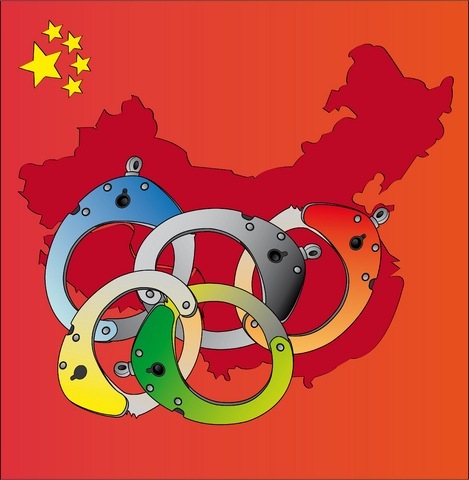 The 2008 China Olympics, the glowing triumph of a repressive authoritarian state pretending that, due to its undoubtedly amazing commercial, industrial and economic achievements over the past 30 years, it merits inclusion in the ranks of democratic nations. The 2008 China Olympics that wants the world, beyond all sensibility, to ignore its brutal totalitarianism and bask in its shiny 21st Century facade. Millions cheerfully ignore what the Chinese government wants to hide, and takes gleaming Beijing at face value. Undeniably, the country (or at least its coastal economic powerhouses) is transforming itself into what superficially looks like a modern, 21st Century nation. While it represses its Tibetan minorities. While it beats insensible those who dare to freely express the truth, recently in the cities of the West, to our collective shame. While it maintains the Great Firewall of China in what ultimately will be a failed effort to prevent the virus of true democracy from infecting that burgeoning middle class the elderly autarchs are so proud of. Well, I don’t buy it. I will resist the impulse to switch on the TV; or search out the on-line video streams that I’ve heard are threatening to overwhelm Internet I. In the same way that, most years, I’m really not that into whose obscenely overpaid mercenaries of whatever sport, wearing the colors of a city most of whose residents can no longer afford to view their sporting events in person, defeats another city’s mercenaries. Enjoy your Olympics, people. Drink your Cokes, use your Visa cards at McDonalds. After all, we’re all in debt to China out to seven generations, why not enjoy some of its spectacle and worry about all that tomorrow. Just don’t call it sport. If war is politics conducted by other means, sport is business conducted by other means, dressed up in colorful flags and shiny stadiums and well paid, photogenic professional mercenaries, so as not to distract us with the messy reality of political prisons, despoiled and polluted landscapes, and cowed peasantry. And the Olympics is such business writ large. This entry was posted on Friday, August 8th, 2008 at 11:47 pm and is filed under Business, China, Democracy, Geopolitics, Global trade, Politics, Sports. You can follow any responses to this entry through the RSS 2.0 feed. You can leave a response, or trackback from your own site. Hey thanks for the link and the reference! It’s much appreciated. I agree with you for the most part, and my commentary over the next two weeks on the Olympics will include political opinion and observations. But I would like to note that the Olympics, as commercialized as they are, also represent the best of humanity. I think that’s admirable, inspiring, and hopeful. Olympic athletes don’t want war. For the most part, their motives are pure–very few gold medalists, on balance, will sign multi-million dollar endorsement contracts, especially those in the more obscure sports like fencing. The Olympic ideal remains an ideal. In Ancient Greece, all the warring states declared an Olympic truce so that Sparta and Athens could compete on the field of sport, not the field of battle. Yes, there will always be bragging rights, yes, there will always be political overtones, yes, national pride will always be at stake. But that’s not the fault of the athletes, that’s the fault of our governments. Last night, in the Men’s 400 Freestyle Relay, however, I was whooping and hollering just like anyone else. The French team declared they would crush the US Team. Eric Lezak out-touched the French anchor in world-record setting time. That’s a kind of achievement and payback that the Olympics are famous for, and I while watching that race, I had no problem jumping in and participating with all the other US flag-waving hordes. With enthusiastic viewers like you, the Olympics will do fine without this old curmedgeon! Thanks for stopping by and contributing to the dialog. Took me time to read all the comments, but I actually enjoyed the write-up. It proved to be Really useful to me and I’m certain to all the commenters right here It is always nice when you can not only be informed, but also entertained I’m positive you had fun writing this post. Looking back at the downfall of sports as we knew it, it becomes very clear whey ‘Reality TV’ is so popular now – it’s the next level of quasi-real-time shenanigans for the masses. I think you missed your true calling. Weren’t you supposed to be a syndicated newspaper columnist? Armand, should I be concerned that my manager thinks I missed my true calling? 🙂 Thanks for reading and commenting!